Follow the steps below to learn how to print photos from Epson printers, using the following instructions. The Epson printer is well known because of its good quality, depending on what printer you have you will be able to print photos with any Epson printer, you will get good photographic quality thanks to the type of ink these printers use. The DURABrite® ink cartridges with pigmented ink allow you to get the better qualities in your photographic printings. It is convenient to consult the manufacturer's documentation before placing any kind of paper in your printer different from the normal A4, the thickness of the paper also influences a lot. Normally the size of photographic papers that you can use to print in domestic or multifunction Epson printer are the following ones: A4, Letter (8,5 × 11 inch; 21,6 × 27,9 cm), 4 × 6 inch. (10,2 × 15,2 cm), 5 × 7 inch. (12,7 × 17,8 cm) when you know that the paper you have is adequate to print there are some other characteristics to take into account before starting printing photos in Epson printers, next we will show you some of those characteristics. Eliminate all the edges that the image that you are going to print could have, you have to take into account that when you print an image with the image setting, if sent from the computer with the image setting, the printer will take away a little space on the sides. Usually photographic paper has one softer and satin surface than the other, you have to place the soft and satin surface in a way that images are print on that surface. 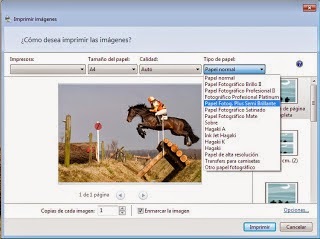 From your computer you have to tell the printer what kind of paper you are using to print photos, this way you will obtain better quality, it is not just to place the paper and click on print, if you do so you will have the quality of a common or A4 printing, however with the photographic settings from printer properties is what makes the difference between a common printing and a photo. The procedure for the printer setting from the computer is simple, we will quickly explain it read the following information carefully, in case of having problems please contact us, we will gladly help you. Open the image or that you want to print. It is recommended to select the “picture” or “superior picture” printing quality option and about the paper you can select the option you consider the best, remember to check the paper position before it gets to the printing process as well as the paper good condition. It is recommended to select the printing without margins option, so later you do not have to cut the page. You can change the picture orientation, you can select between horizontal and vertical and to start printing just click on the print option.